One punch man workout: Most of us wish to be fit like action heroes and fight with the villains. We all are familiar with the fact that we won’t be able to achieve the body or physic like heroes or heroines without doing any exercise. To be fit, we have to maintain a diet and do exercises regularly. Most of us watch movies, T.V Shows, Animated videos, video games in which the hero fights with the villain and gets his property back (which includes many more such as princess, power, money, justice and so on). How can we work out as our superhero? Nowadays everything has become technological, and in a day many new games are evolved. In today’s article, we are going to know about ONE-PUNCH MAN. It is a Japanese superhero webcomic created by ONE which came in the form of series in early 2009. One wanted to focus more on everyday problems and include them in the series. The series become viral and hit around 7.9 million people in June in an incredible way. The series is all about a hero who has an unusual issue. He is too strong that he can end the fight with his single punch and call the One Punch Man. The series comprises of animated fights and extraordinary background work which is being attracted by most of the viewers and made this series popular. Most of the viewers are interested in the evolution and the fitness of the one punch man. Well, in our article we all are going to come to know about the details of one punch. The name of the hero is Saitama, whom itself started as a joke at Japan’s action. Later it had become into a well-drawn series from which the viewers are expecting to see Saitama as the killer of a monster. The series describes all about the secret training offered to the hero which changed him from a humble Japanese Man to a super hit hero. So, let us get started with the work out of our superhero. The same process goes on for 7 days a week. Most of us may not have the power to hit and finish the opponent with a single punch. If you practice the above tasks, then you can do it. But the fact is that in the gym we exercise through machines whereas through this we can reduce the machine power. The workout includes push-ups( which helps you for the movement of your body), sit-ups (part of the core-training), leg training which comes from squats and cardio from running. This training is more beneficial than gym training. This method doesn’t need any type of machine power, there will be issues related to injury, and finally, the muscle power increases. Boxers, Martial artists, and another sportsperson who wish to be fit are suggested to follow the tasks mentioned above to be fit and healthy. The user feels very funny. Well, it is not easier to work out as Saitama. It isn’t as simple as hammering out 100 reps of 3 exercises and running out 10 km. Break up the 100 reps into multiple sets with a minimum break of 2 to 3 minutes. This method helps you to be not tired and be healthy. Instead of working out whole day divide the reps shortly as morning 10 Sit up’s, Push up’s, squats and after 10 mins do repeat the process. We advise to follow the above methods only 3 or 4 times a week and take rest. If you do this exercise continuously, then it may affect your health both physically and mentally. Monday: 5×5 Push-ups,5×10 sit-ups, 5×5 Squats. Wednesday: 5×6 Push-ups, 5×11 sit-ups, 5×6 Squats. Friday:5×7 Push-ups, 5×12 sit-ups, 5×7 Squats. Monday: 5×8 Push-ups,5×13 sit-ups, 5×8 Squats. Wednesday: 5×9 Push-ups, 5×14 sit-ups, 5×9 Squats. Friday:5×10 Push-ups, 5×15 sit-ups, 5×10 Squats. Monday:7×6 Push-ups, 7×10 sit-ups, 7×8 Squats. Wednesday: 7×7 Push-ups, 7×11 sit-ups, 7×9 Squats. Friday:7×8 Push-ups, 7×12 sit-ups, 7×10 Squats. Well, here comes the most interesting topic which is nothing but the diet (food). The only rule our superhero has followed is not to skip the breakfast. You can have a banana in the morning. To balance the PH of your body, for muscle’s movement, to get vitamins and minerals you are supposed to eat more vegetables than meat. If you are working out for 3 days a week, then you have to choose protein powders like Optimum Nutrition Gold Standard or Dymatixe XT Line. These are the few steps which we recommend you to follow to be as our superhero Saitama. So, why late guys are you all ready to be as Saitama. If you do so then start doing the tasks and be fit and healthy. I hope that the article was helpful. Eat well, be happy and always keep smiling. Have a good day to all of you. 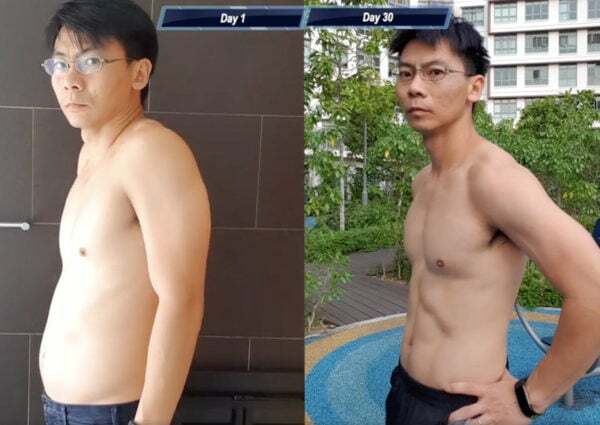 One of the best One Punch Man Workout result got a Singaporean 38 Year Old guy Sean Seah. 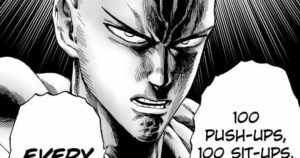 He Accepted 30 days challenge of One punch man and got unbelievable results. He is 40 years old and how he was looked like before challenge, His weight was 70kg and fat rating 10. 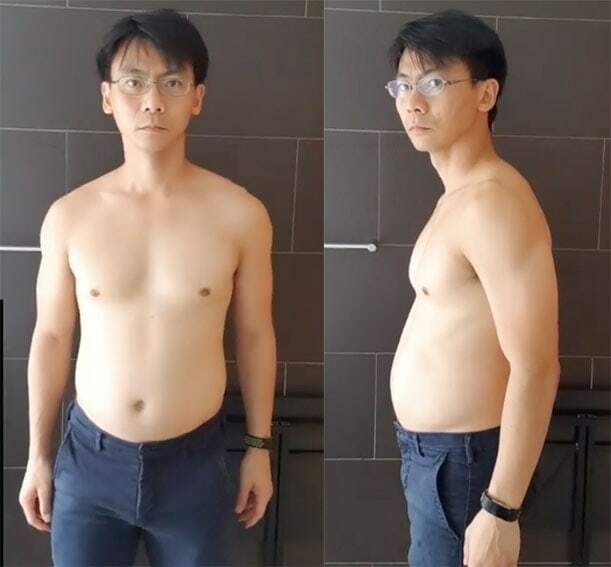 By day 17, Seah acknowledged he had hit a level and quit getting results. Thusly, he expanded his exercise to level 7, completing 70 push-ups, 70 sit-ups, 70 squats and a 7-km run every day. 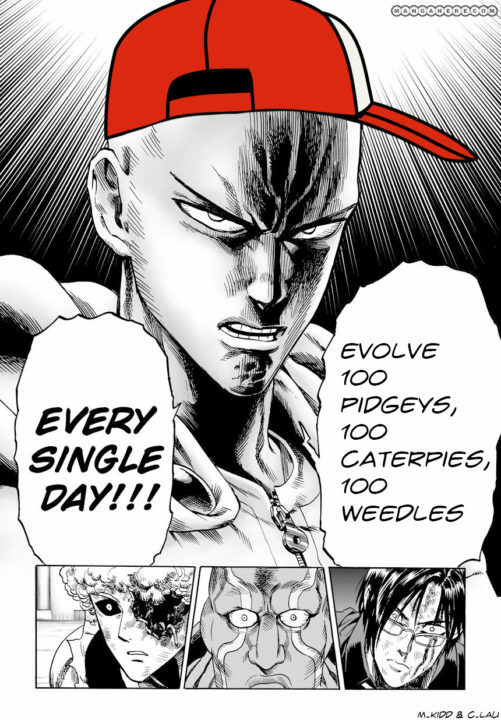 By day 22, he increased it to level 9 and by day 23, he was finishing the full One Punch Man exercise at level 10. Seah said he would not be proceeding with the One Punch Man exercise regular yet will rather adhere to an increasingly economical three to four times each week preparing plan. He will likewise be including opposition preparing by setting off to the rec center. its really useful. all people must try this. 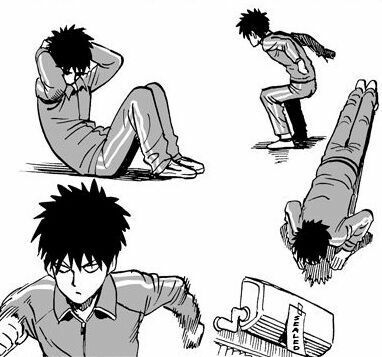 Thanks for the sharig great article about saitama’s workout. The information provided in this article has been very helpful for me. I Was struggling to find a diet plan and exercise to help reduce my weight. This one definitely proved to be the life saviour. The exercises mentioned in this article are not to hard to follow so i was able to continue it for the long time. I am a working individual and have been suffering from obesity for quite some time Now The one punch fitness routine have been very useful for me as it had helped be cut down weight. Now i am proud of body and confident too. Thanks a ton for such beautiful insights on weight loss. You made be happy and extrovert. In addition all the workouts mentioned can be carried out in home so you don’t have bury a hole in your pocket and go to the gym. One punch man workout is one of the most loved workout to get results if you implement it proper way. Hopefully you got good results. Keep reading, keep daily workouts. You can find video about it on youtube, There are lots of videos available about saitama’s workout results. 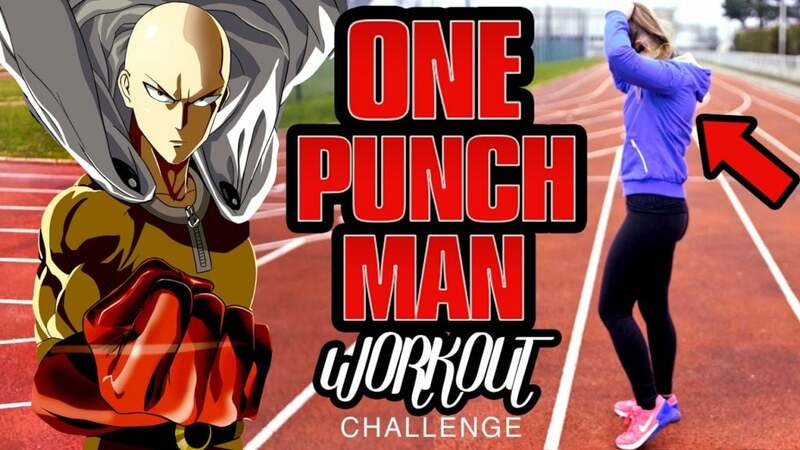 You may also search “one punch man workout” results you will surely get lots of videos. It will help you a lot. Please try now, its working fine. Thanks for the info. I am in fact happy to glance at this website posts which includes plenty of valuable facts, thanks for providing these statistics.